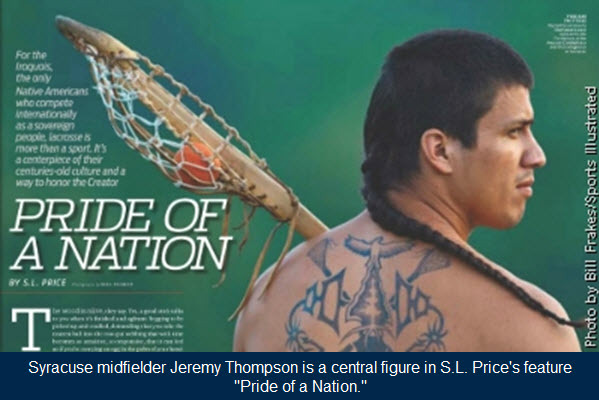 After the Iroquois Nationals team were denied the opportunity to travel to the World Championships in England this past summer, SI decided to do a very nice story on lacrosse, featuring the tradional sticks and Alf Jacques, stick maker to the Iroquois. The Iroquois were denied travelling on their sovereign passports which had been recognized for the past 20 years. What he means is, at a time when the Iroquois are struggling to protect their language and culture from the enticing encroachments of American life, when each Iroquois lacrosse player who goes to Syracuse represents, yes, a success story but also a flight risk—a man in danger of losing his Native ways—things such as lineage do mean more than the world's biggest lacrosse tournament. Iroquois tradition requires that chiefs make each decision with an eye on its impact seven generations from now (hence the N7 logo on Nationals gear); there's a reason Lyons calls Nike the team's partner, not sponsor. Today's Iroquois fear being subsumed, fear Culture USA more than Team USA, and the message We are still here will mean little if the we is allowed to grow fuzzy.